-This is what my own kids, and our dog, have looked like for the past month. -YES, at my core, I do believe that's how kids should be playing. -It's very easy to sit in Berkeley, California -- where THERE IS NO MUD SEASON -- and say that's how kids "should" be playing. Never, in the five years I lived in the Bay Area, did I see kids who really looked like this. It's mud season here in Vermont, that fifth season that marks the transition between winter and spring. The snow melts, the ground thaws, and until the trees burst open green leaves we spend weeks squishing through inches of mucky mud. My own yard, which is more crabgrass than actual grass, is a muddy soup, with a couple of watery pits that might actually qualify as swampland. Our dog, who is of the free-range variety and spends most of her days outdoors, looks as if she's wearing brown knee socks by evening. My children look even worse than the dog. 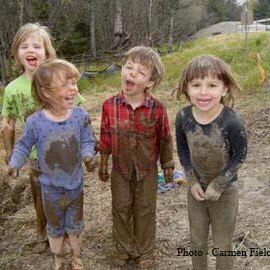 This year, they've decided that they LOVE mud; that "mud is more fun than snow!" On one level, I'm thrilled to have three girls who aren't afraid of getting dirty. YES! That's how kids should be playing! But then there was the afternoon that I pulled up at my daughters' preschool and saw what looked like a brown-paper cutout of a small child lying on the front steps. Upon closer inspection, it turned out to be the formerly pink-and-purple snow pants, mittens, and boots of my middle daughter, completely caked in mud. SO caked in mud that her teachers apparently couldn't bear to bring them inside. So these days, I take a deep breath (and a few extra plastic bags) whenever I pick up my two oldest daughters from preschool. I've solicited the opinions of more experienced parents on the best way to deal with the mud-festation. It turns out that, like most unpleasant things in life, there is no shortcut. The best way to handle mud-soaked clothes is pretty much what you'd expect: let them dry out (in the case of my middle daughter's mittens, this took three entire days), then whack them against something -- preferably outside -- to remove the worst of the caked mud, and let the washing machine deal with the rest. Needless to say, with three muddy children and a dog, every entryway in our house is littered with flakes of dried mud. And our mudroom is finally coming by its name honestly; the flooring could now best be described as "multicolored slate with a dried mud finish." It just so happens that this mud season, a friend loaned me the first two seasons of the popular BBC drama "Downton Abbey." For those who haven't followed the "Downton Abbey" craze, this television series depicts the lives of a noble British family and their servants in a sprawling country manor during the early 20th century. It's gripping, but not the best viewing material for mud season; as the final credits roll after each episode, I always find myself thinking, "I could handle mud season, if only I had some STAFF around here!" This is the second year that I've lived in Vermont, but I consider it my first real mud season. Perhaps because winter wasn't terribly impressive last year, I wasn't impressed by mud season. This year, with more melting snow to soak the thawing earth, mud season has gotten my attention. And I must say, my feelings are extremely mixed. On the one hand, mud season seems a little cruel -- or at least taunting. It's not a consistent season; things don't progress neatly from winter to mud season to spring. Instead, we'll have a week of warm temperatures, melting snow, and mud, followed by a blast of frigid air that refreezes the ground and brings another coating of snow. Winter’s been long and cold and dark, and of course we're all longing for the warmer, brighter, greener days of spring. But in the depths of my soul I feel relief every time the ground refreezes and the snow falls again; at least I know I won't have to contend with a dirty dog and muddy outerwear for a few days. Mud season makes me lazy, complacent: I'd rather stay in winter than have to pass through mud season to reach spring! On the other hand, thereis an undeniable thrill to mud season. My children won’t grow up saying that they never made mud pies! The days are longer and we can play outside before dinner! Listen to those birds calling! See those green shoots poking through the ground! And there's hope: that maybe tomorrow I’ll wash the snow pants for the last time and pack them away until next year, maybe tomorrow the ground will be firm, maybe tomorrow I can finally scrub that mudroom floor without it seeming futile. In the end, perhaps the true beauty of mud season lies in its difficulty. It's not hard to welcome warm and verdant spring and summer after a cold winter, and it's not hard to welcome the crisp cool blaze of fall and the first lovely snow after the heat of late summer. But mud season forces us to overcome our laziness and complacency, to cling to hope, and to accept that sometimes the most fun comes with the most mess. That's how kids -- and the rest of us -- should be playing.